In a women’s hockey game against the Carleton Ravens on Feb. 4, Concordia Stingers forward Stéphanie Lalancette earned an assist while sitting on the bench. Midway through the second period, Lalancette carried the puck into the offensive zone before running out of room in front of a Ravens defender. She dropped the puck to her linemate, Audrey Belzile, then headed to the bench for a line change. As Lalancette got off the ice, Belzile circled around and scored a top-shelf goal. A point from the bench for Lalancette on a Belzile goal. That’s the type of season Lalancette is having: one filled with assists. Belzile scored four goals in that game, and Lalancette assisted on three of them. It’s clear that Stéphanie Lalancette and Audrey Belzile also have a good relationship off the ice. Photo by Alex Hutchins. Lalancette is tied for the third-most assists in the Réseau du sport étudiant du Québec (RSEQ), with nine total. Five of those assists were on goals by Belzile, and the other four were by the other player on her line, Lidia Fillion. Even though Lalancette is the passer on that line, she scores goals too. Head coach Julie Chu said Lalancette is always giving her full effort, be it at practice or in games. Stéphanie Lalancette scored her first two goals of the season against the McGill Martlets on Oct. 21. Photo by Kirubel Mehari. In her rookie season last year, Lalancette scored six goals and added 10 assists. This season, she already has seven goals to go along with her nine assists in 17 games. Although Lalancette is feeding Belzile goals with the Stingers, the pair played on rival teams in CEGEP. Lalancette played for the Limoilou Titans, and Belzile played for the St-Laurent Patriotes, two of the top teams in college hockey. “Before we were enemies, but now we’re really good friends,” Belzile said. In the 2014-15 season, Limoilou beat St-Laurent in the final, and the year after, Limoilou eliminated St-Laurent in the semi-final en route to winning the RSEQ championship. Lalancette said that championship experience helped her bring a winning mentality to the Stingers. She played with many current Stingers at Limoilou, including forwards Claudia Dubois and Marie-Pascale Bernier, and defencemen Claudia Fortin, Audrey-Anne Allard and Aurélie Hubert. Lalancette said playing with her CEGEP teammates at Concordia is a fun experience. “We knew each other, so it helped us in our everyday life and on the ice too,” Lalancette said. In her rookie season last year with the Stingers, Lalancette continued her winning streak. Despite finishing the season with a 10-9-1 record, the Stingers upset the Université de Montréal Carabins in the first round of the playoffs, and secured a spot at nationals, where they finished in fourth place. Stéphanie Lalancette battles a McGill Martlet during a game on Feb. 10. Photo by Alex Hutchins. 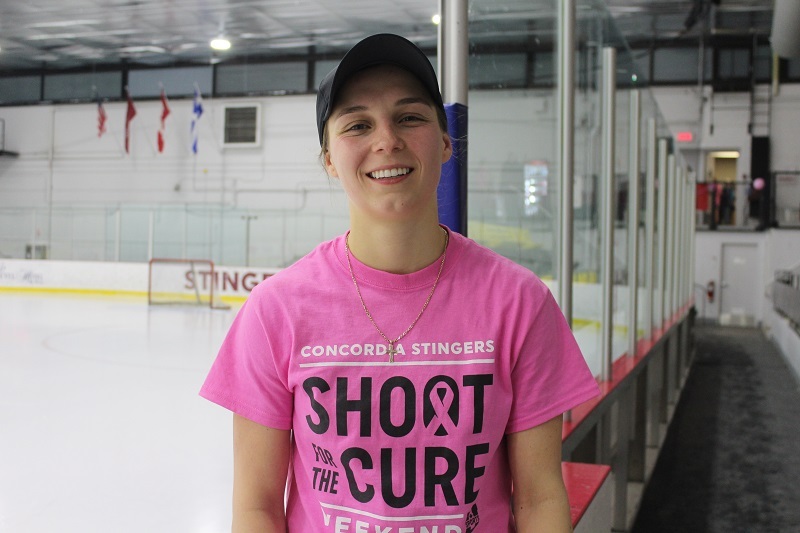 Even though Lalancette has up to three more seasons left with the Stingers after this one, she doesn’t stop thinking about her future in professional hockey. She said her goal is to play for Les Canadiennes de Montréal, but needs to focus on school in order to get a job outside of hockey. She’s currently studying leisure sciences. Through two seasons playing with the Stingers and studying at Concordia, Lalancette knows the challenges of being a student-athlete.